The more you think about tailoring your shed to suit your every last whim, the more time you’ll want to spend in there when it finally becomes a reality. Make your shed just perfect for your needs, inside and out, with any of these unique touches. Why settle for a basic backyard shed when you can trick it out to be so much more? With a little imagination, you can gain inventive storage options, add distinctive architectural features, and give your shed a premium look that will make your neighbors green with envy. The key is to plan the structure to meet your needs and build it with superior materials, such as LP® Outdoor Building Solutions® engineered wood products, rather than simply picking up a plastic shell of a building and dropping it into your backyard. 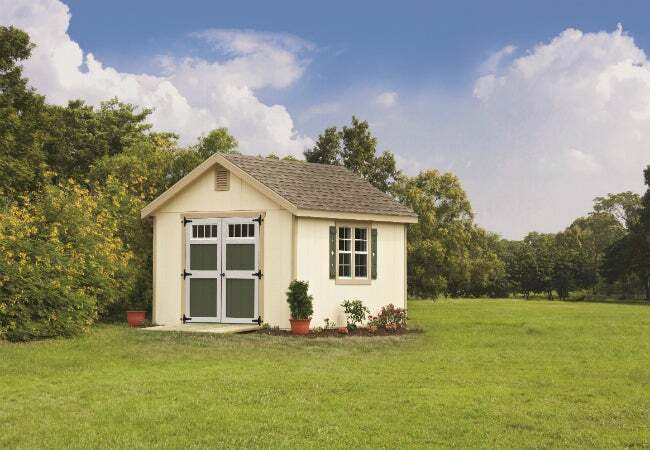 Then, for sure-to-please results, embark on a customization plan to make your shed truly yours. Don’t know where to begin? Read on for five smart yet sometimes overlooked possibilities. 1. Eke out extra space overhead. A gambrel roof—a style that dates back to the barns of early Dutch settlers in the American colonies—provides lots of extra headspace, thanks to its double-sloped sides. You can leave the area open, perhaps adding a skylight or windows to bring natural light into shed that serves as an art studio, craft room, or woodshop. Or, if your goal is to max out storage, add loft boards to create the equivalent of an attic. 2. Insist on materials that are as good-looking as they are hardworking. Say “shed,” and some folks think “shack.” Well, they haven’t seen LP Outdoor Building Solutions’ inspiration gallery! Projects built with LP SmartSide® Trim and Lap Siding take on an appearance of genuine craftsmanship, with smooth finish or cedar texture trim and striking styles for a fully custom look. Meanwhile, walls built with LP SmartSide® Panels with SmartFinish®, a durable overlay free of the knots and voids often found in plywood, enhance the inside of the shed to match its professional exterior. LP products treated with SmartGuard® also protect against rot and termites. Shelves, drawers, and other storage components should specifically address the purpose of your shed. Will you need hanging racks for bikes and sports gear? Ceiling-high shelving to keep seasonal decorations out of the way? Vertical compartments for stashing long gardening tools like your rake and hoe? A wall-hung holster that puts power tools within easy reach? How about a fold-down worktable, or a bench with roll-out cabinets beneath? Ensuring that everything has a spot will free up enough floor space for you to move around. From the Italian for “small cup” and dating back to the Renaissance, a cupola is a decorative roof addition that consists of a base, louvered sides, and a cap—with or without a weather vane. Available in a variety of shapes (often square or octagonal), a cupola makes an attractive focal point, but it has functional benefits too. The vents, for instance, allow air into a shed and aid ventilation. 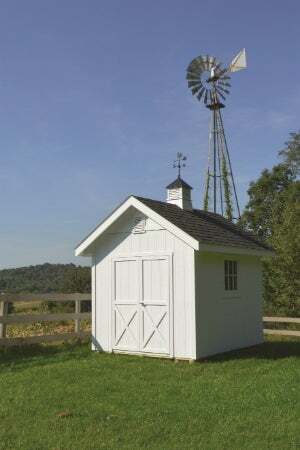 Cupolas may also have windows to let in the extra natural light needed for working in the shed or locating stored tools. 5. Extend the shed’s footprint with a pergola. A pergola is an open outdoor canopy that can increase the usable space on one side of your shed. A pergola can create partial shade for a seating or dining area or provide a framework for twining vines, espaliers, or other foliage. Plus, with plenty of different pergola styles to choose from, you can leave yours entirely open, erect latticework along the sides, or drape it with fabric so you can open up or enclose the space at will. Are your creative juices flowing? Visit LPShed.com for more ideas, tips, and advice for designing your shed, your way.